This is an easy fall salad that tastes as fresh as can be. 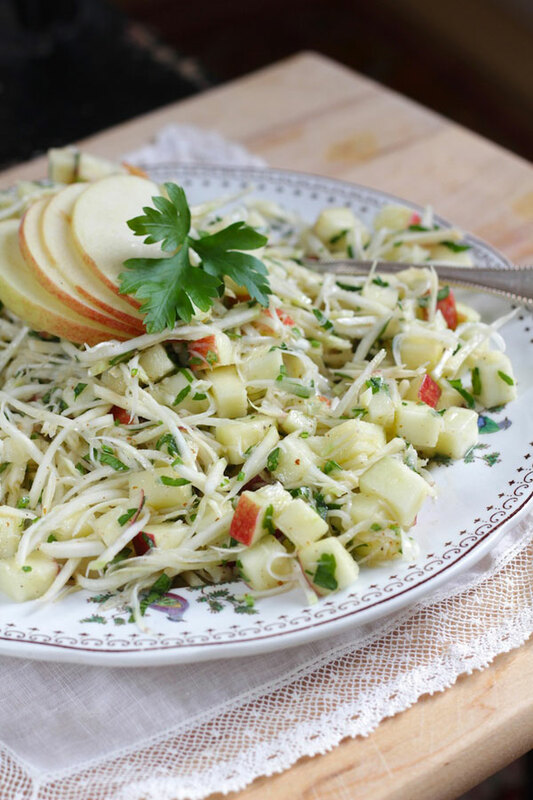 It combines seasonal celeriac (or celery root as it’s also known), apples, and parsley with an apple cider vinaigrette. It’s a lighter take on a celeriac remoulade, a wonderful French recipe that combines grated celeriac with mayonnaise and dijon mustard. I did away with the mayonnaise and replaced it with a light vinaigrette instead. I also added apples which lend sweetness and pair beautifully with the more earthy flavors of celeriac. 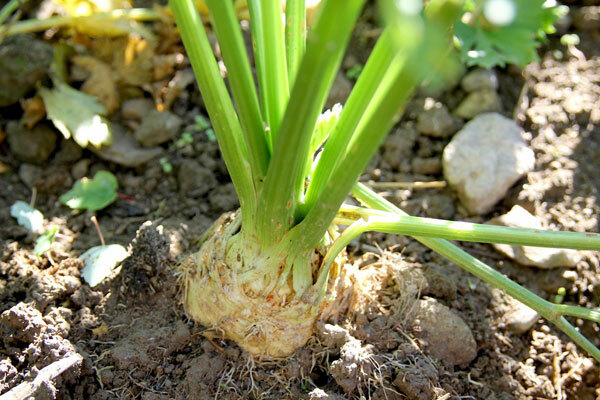 If you’ve never had celeriac, don’t be intimidated by its gnarly appearance. 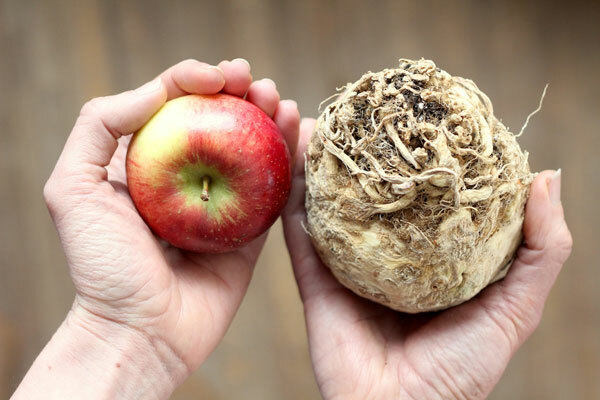 Though its flesh tends to on the dry side, celeriac’s claim to fame is its distinct flavor, a bit like a cross between celery and white turnip. I can’t get enough of it! As a fall vegetable that stores well through the winter months, celeriac deserves much more praise and attention than it receives. It can be roasted with other root vegetables, pureed into fragrant soups, or simply grated (or julienned), and tossed raw into salads such as this one. As an aside, crumbled blue cheese and chopped walnuts are delicious added to this salad. A little chopped pear works beautifully as well. Feel free to modify it to suit your tastes and do let me know what you think in the comments below! Grate or julienne the celeriac until you have approximately 2 cups worth. Wash the apples well and core them, leaving the skins on. Cut them into 1/4 inch cubes. Toss the apples in the lemon juice, mixing to coat them (this prevents them from browning). 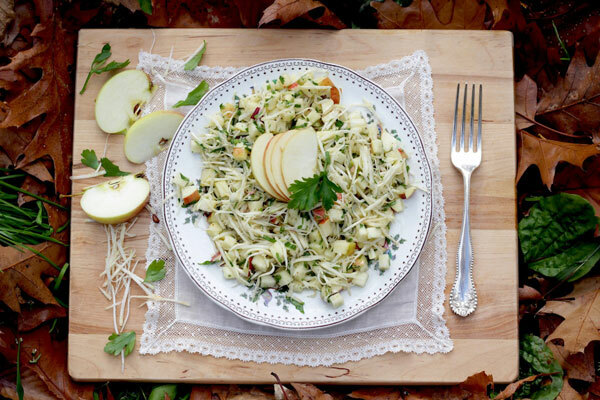 In a medium serving bowl, combine the apples, celeriac, and the finely chopped parsley. In a small jar, combine all the vinaigrette ingredients and then shake vigorously until combined. Pour over the salad and toss well. Taste before serving and add more salt or pepper if necessary. Optional add-ons are a bit of blue cheese & chopped walnuts, which are delicious crumbled on top.